I live in a piece of history, within a piece of history. My house was constructed in the early 1900’s by Peter Leonard, a residential contractor who was very active building homes in what is now known as the Outer Sunset neighborhood of San Francisco. Peter’s son got ownership of the house in 1936, and at some point afterwards it was occupied by none other than Senator Diane Feinstein, but that is only hearsay I’ve yet to substantiate. 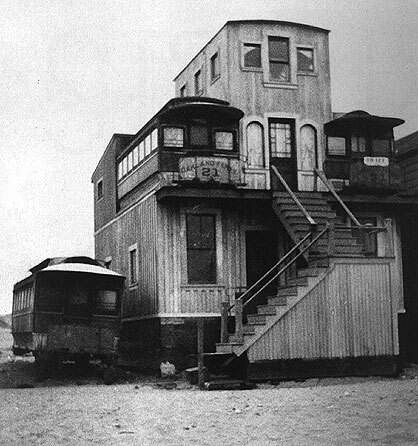 This home, one of the earliest real houses built in the wild Outside Lands of SF, when first built stood among a sea of sand dunes and a shanty town of horse-drawn railcars converted into homes. Layers upon layers, history is like an onion. As my house as its own hidden history so does my neighborhood and both are quite fascinating. Outside Lands Music Festival takes its name from this rich history that dates back to the Gold Rush. Throughout the 1850s and 1860s these Outside Lands were the subject of many court battles, ultimately becoming part of San Francisco in 1866. Five years later the land that became Golden Gate Park was surveyed and work on the park began, to be completed nearly a decade later in 1880. The park was meant to be a pleasure ground for the people of SF and that has not changed much, and Outside Lands is certainly keeping that history alive. I was a bartender at last year’s Outside Lands and it was easily the most fun gig I have ever worked. Soon the dunes of the Outside Lands gave way to a Victorian steampunk paradise; a small wild west shanty town transplanted onto the windswept sands of San Francisco. While horse drawn railcars ruled the day during the mid-19th Century, by 1883 all horse lines had been converted to steam, cable, or electric. The tipping point was in 1895, when the Market Street Rail Company ran an ad in the SF Examiner selling railcars for $20 a piece ($10 with the seats removed). So it was that Carville by the Sea came into vogue along with the trend of living in converted railcars, which gave the suburb its name. Welcome to the rough and tumble rowdy and bawdy suburb, Carville by the Sea. The prior year, 1894, saw the Midwinter Fair come to Golden Gate Park; this was one of the SF World’s Fairs. This fair gave birth to the world famous Japanese Tea Garden. If you’re interested there is one confirmed Carville house still standing (inside the house). I love the comparisons of early 1900’s hipsters to early 2000’s ones in that last link, as it is totally true; Carville was largely a bohemian artist enclave. While much has changed in SF, some things have never changed (here’s looking at you fixie bikes and repurposed housing). Carville was around for about two decades before the massive 7.8 magnitude quake that devastated SF in 1906. My house had just been completed before the quake hit. I can imagine Peter and his wife, huddled together with their child for safety somewhere in the middle of the very solid house he built. Aerial photos from 1906 show my house still standing strong, just like it is today after another huge quake in 1989. Carville by the Sea, circa 1906 (the year of the quake). By 1910 Carville began to lose much of its quirky, esoteric charm as the old car-houses were either ripped down or planked over to hide their roots. At the time this was looking on as improving the community and was celebrated with fireworks, today we’d call it gentrification, followed by another much more rapid round during and after WWII. This finalized the Sunset’s present day reality as a sea of tract houses dotted with islands of apartments and small shoals of Victorian homes, leftovers of a layer of history buried below the sands of time. The fierce Pacific winds still blow non-stop, propelling sand at violent speeds into skin and against stone, threatening to consume the land that humanity has encroached upon. This ever changing yet still quirky and bohemian neighborhood is my home, and I could not ask for a better one. If you’re still craving some more Carville history check out FoundSF and the excellent book by Woody LaBounty. For some more photos you can head over to Invisible SF. Note: You may have noticed I took great care not to mention my address or provide any incriminating information enough to out where I live exactly. This is because I believe in practicing locational privacy. Be smart and do not give out personal info like phone numbers or addresses publicly. Very Interesting! Saw your link in the Bold Italic comments and came over to check it out. I love how well-researched this is and how sincerely interested in the neighborhood you are! I grew up in the Sunset (inner) but never knew about Carville until recently. Thanks for the colorful history! Someone has to do their part to keep the color in the Carville avante garde! Glad you liked the article. I’m a Potrero Hill native myself, but my parents moved us to Marin pretty quickly after I was born (Potrero wasn’t hipster-ville in the late 80’s, we still had shootings then). It’s good to be back in the City, especially an area with so much character and a house with a proven track record for surviving earthquakes. There is one problem I can see – the aerial shot of San Francisco could not have been taken in 1906. Aerial photography from that location would have been unlikely, since it would have had to have been from a balloon, and the Marina District did not exist, though it is clearly visible in the shot. The image is probably from sometime between 1920 and the early 1930s. Good catch on that. I had the same thought when I first found that image but I didn’t fact check it as well as I should have.